Get high quality full color printing at an affordable price. Our flyers are full-color offset press prints on one side of 80# gloss text (4/0) with optional aqueous gloss coating (add 5%). 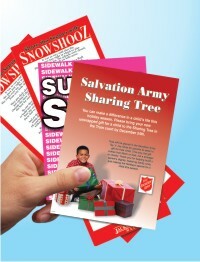 Flyers are great for use as bag stuffers, brochure inserts and handouts. Looking for DOUBLE SIDED Flyers and Bag Stuffers? SETUP FEE: A $25.00 setup fee applies to orders of 0 items or less of a given design and layout. The setup fee is waived for this design if it isn't customized (your logo is always included at no additional cost). Setup fees are automatically added to your shopping cart.